What is EasyConnect Smart Dialer? 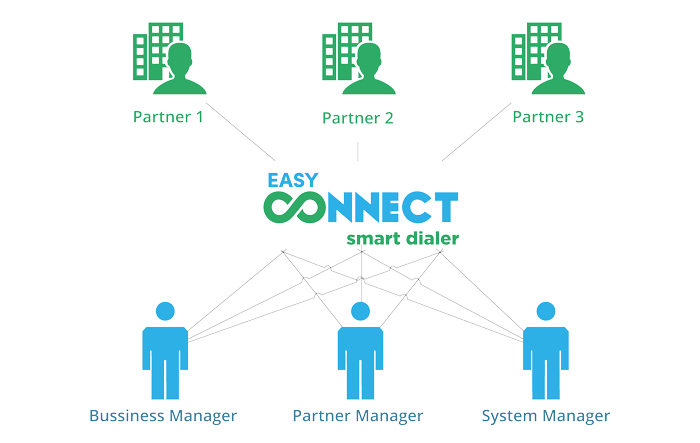 EasyConnect Smart Dialer is a secure internal and outsource management platform that can take inbound and blended calls and deliver preview, predictive, power and agentless calls in line with BTK and BDDK regulations without having to share customer data with outsourcing firms. EasyConnect Smart Dialer is an End-to-End Call Center Platform where customer representative applications, IVR flows and external call rules are designed once, enabling operational standardization, dynamism and cost reduction. What Are the Fundamental Features of the Product? It consists of Desktop, Web and Service applications. It is flexible and configurable. It can be upgraded, or customized for the customer. It’s secure and it limits process and data share, and it’s monitored. It can be used in both inbound and outbound process management. It reduces the costs by executing Preview, Predictive, Power and Blended campaign models. What Are the Advantages of Smart Dialer?